"The brilliant crimson of roasted beets lends a gorgeous hue to this mineral- and protein-rich salad. Roasting the beets brings out their true sweetness and tender texture in contrast to the chewy quinoa and crunchy walnuts. Perfection!" Preheat oven to 425 F. Wrap beets in foil and bake until extremely tender, about 45 minutes to 1 hour. Let cool, then slip off the skins (do this while holding the beets in a damp paper towel to avoid staining hands). Dice into 1-inch cubes and set aside. Rinse quinoa well. Add to a pot with 2 cups of water and bring to a boil, then reduce heat to low and cover. Allow to simmer, untouched, for 25 minutes, until water has been absorbed. If necessary, continue simmering until all water is absorbed, then uncover and allow to cool. (If you are in a hurry, you can turn the hot quinoa into a glass bowl at this point and place it in the fridge for about 30 minutes). In a pan, heat oil and add garlic, lemon rind and ground spices. Cook and stir for 2 minutes, then add balsamic vinegar and lemon juice. Remove from heat. After cooling for a few minutes, stir in dijon and honey. 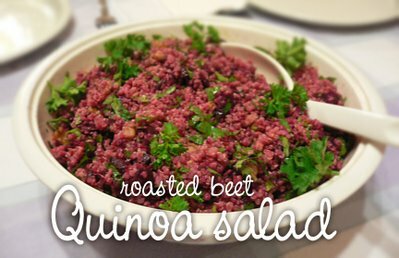 Add beets to cooled quinoa. Break walnuts into pieces and add to the bowl. Pour dressing over and toss well until quinoa becomes pink. Add cilantro and parsley and combine well. Season to taste with a bit of salt and pepper. This salad is even better the second day, after flavours meld. Makes 4 servings. This was awesome! I varied it by using gold beets, omitted the garlic, honey, mustard, and vinegar, and added roasted asparagus, green beans, and pumpkin seeds. I'll definitely make this again.